Corruption measures a country's bureaucratic morality throughout the ranks. A country with high corruption suffers widely from embezzlement and loss of the leader's authority, while a country with no corruption is free to prosper. Unlike inflation, corruption does not directly affect monetary costs, instead affecting other areas of the state (though it may indirectly affect income due to raising the local autonomy floor of provinces). Eliminating corruption enables beneficial Corruption events, while increasing corruption enables increasingly bad events. +0.005% per year for every point of Overextension, +0.5% per year at 100% overextension. +0.001% per year for every point of religious unity below 100%, +0.1% per year at 0% religious unity. +0.5% max per year for unbalanced research. +0.1 per year for not having an active debate in Parliament. +2% immediately by “Debasing Currency” (only with Rights of Man). +0.02% per territory over max number of states (capped at +0.8%). +1% max per Banners regiment raised, divided by country's force limit (only with Mandate of Heaven). 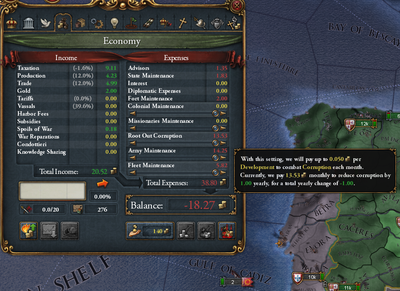 -0.05% per year for being ahead of time in diplomatic technology. -0.05% per year for being ahead of time in administrative technology. ↑ See in /Europa Universalis IV/common/static_modifiers/00_static_modifiers.txt (Static modifiers#Corruption).